The festival takes place April 28, April 29 and April 30 in Karval, one of North America's largest breeding grounds for this elusive bird. Birders, nature lovers and families will enjoy unique bird watching on ordinarily inaccessible private land, wildlife viewing, entertainment, history and lots of great food, including an authentic Saturday night chuck wagon dinner. The Mountain Plover is a bird that begins arriving on Colorado's central plains in early April. Plovers find the short grass prairie and fallow fields in the area to be excellent habitat and Karval is one of the largest nesting grounds in the nation. Mountain Plovers migrate over the Rocky Mountains from California, hence the name "mountain," and stay in the area usually through September. Birders visit this area from all over the world to spot a Mountain Plover. 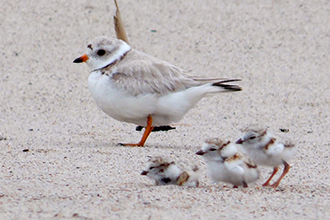 Often referred to as the "ghost of the prairie," plovers blend in with the environment. Nests are tended by both female and male plovers. Third generation ranchers, the sons and daughters of Colorado homesteaders, lead day and evening tours on public and private land. Tour guides take guests through the spring hunting grounds of Native Americans, sharing stories and visiting local historic sites including a prairie school house. "We bring the plover lovers to the bird," Karval Community Alliance President Jeff Thornton said. "Along with bird watching, our guests get the chance to mingle with farmers and ranchers who have lived on this land for generations, eat home style food including a chuck wagon dinner with authentic western entertainment and learn about conservation practices and the history of this unique part of Colorado." The Bird Conservancy of the Rockies has been working closely with the Karval Community Alliance since the start of the Mountain Plover Festival in 2007. Landowners and biologists are working together to study and preserve the nesting grounds of this elusive species. The Mountain Plover Festival in Karval is a unique opportunity to explore the human and natural communities of Colorado's Eastern Plains which at this time of year can be full of song birds and other birding surprises, the Bird Conservancy of the Rockies added. For more information and to register, visit www.mountainploverfestival.com.